I met a beautiful lady on a plane recently who was desperately trying to lose weight without success and it was dominating her every thought. She was 45 years old. Her life was hectic. She was helping manage a family business with constant travel, she had 3 kids and was the family “taxi service”. She was exercising at midnight to fit it in, then sleeping for only 3 hours, and living on coffee to get through each day. She was also trying fasting to reduce calories. Her clothes just kept getting tighter and nothing as budging. She was at a loss – confused and frustrated. Tired but wired and overwhelmed. Sadly, I hear the above scenario more in my practice now than ever before. trying everything but nothing seems to be working? 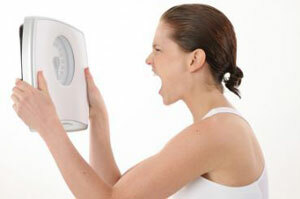 eating clean, eating less than ever, trying every diet and exercising incessantly but the weight “just won’t budge”. I’m sorry to tell you, but if your strategy hasn’t worked over the last months then you won’t wake-up tomorrow and it start working despite all of your efforts. The answer can lie in the fact that you are predominantly living in the wrong nervous system – you are living in the “flight or fight” nervous system (i.e. our sympathetic nervous system) and your body is holding on to everything because it doesn’t think it’s safe. It can’t feel safe because you are stressed, exhausted and lacking nutrients. 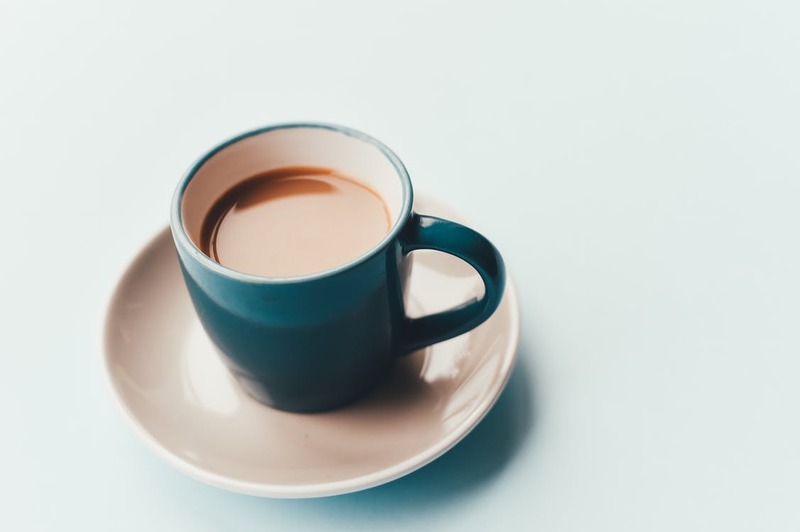 While you don’t want to hear it, coffee can be big a contributor to this sympathetic nervous system dominance (yes, even if it is only one cup per day). Yes, your favourite elixir may not be your ally. Coffee immediately puts the body on this high alert (.. hello anxiety!) and the body will continue to call on it’s readily available stored sugar (versus fat) stores. Sadly, we are now consuming 3 times more coffee per day compared to the 1960’s. It is an addiction and our health is suffering for it. I strongly encourage you to reduce your coffee in-take. Do it gradually by “swapping” those excess cups for something nourishing like a herbal tea … or better still an organic chai Velvet Latte! 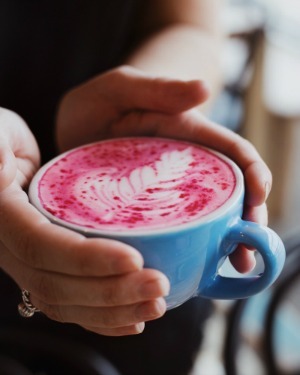 Yes, you too can join the Velvet Latte revolution and treat yourself to this deliciously nourishing cup of calm everyday. 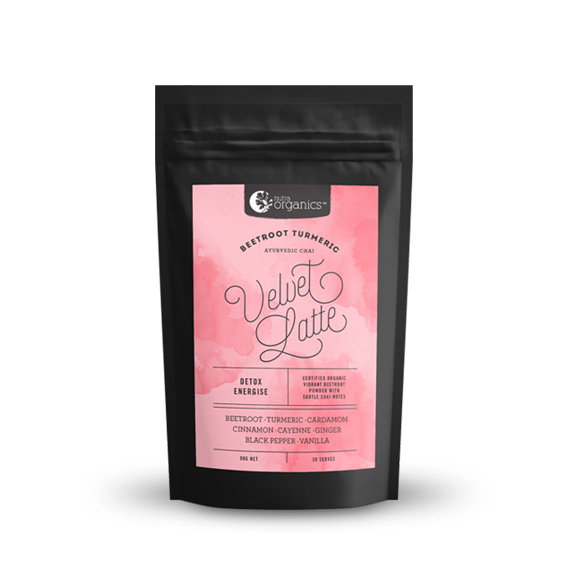 Velvet Latte is an amazing dehydrated powder.. Simply add warmed milk of choice! It’s organic, free of caffeine, gluten and dairy, and made with beetroot and chai spices for a natural subtle sweetness that tastes delicious. Start embracing a lifestyle where the body knows it is safe. Embrace real food, sleep more, breath, exercise gently and try reducing and swapping your coffee for more nourishing choices like my chai Velvet Latte. You can also contact me for a consult if you need greater guidance. P.S. I’D LOVE YOUR HELP! Please share with me your favourite coffee haunts in Singapore so we can start a health revolution. Email me at hello@soniaosborne.com and tell me where they’d love to see Velvet Chai Latte stocked. It is already flowing at Luxe Sydney, Pattissez and Kitchen by Food Rebel !